All heating systems are ran at the highest setting of the thermostats for at least 30 mins. and checked for signs of improper operation, CO and combustible gases at room vents. Then the thermostat is turned off and then the system restarted and checked a second time. We have found heating systems that are short cycling because of cracked heat exchanges, faulty regulators and bad temperature sensors. 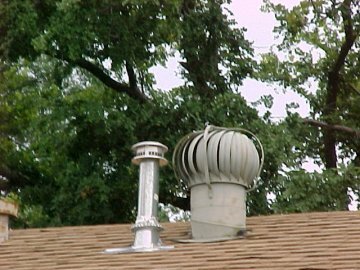 Gas heating systems are checked for proper drafting and venting. After thousands of inspection we have become regarded at top in our field in HVAC inspections. During two other pervious inspections of this property this was missed by the other inspection company and an Licensed HVAC company. The homeowner had been suffering from carbon monoxide poisoning off and on since 1999 and no one had been able to determine the problem. The wind turbine and roof air currents have caused the gas vent stack to back draft gases from the heater. 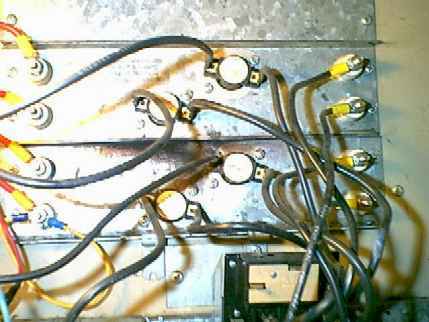 This was repaired for our client and the seller was shocked that we were able to troubleshot the problem so easily. A closer look and some expertise is needed. LOOKS OK, right! 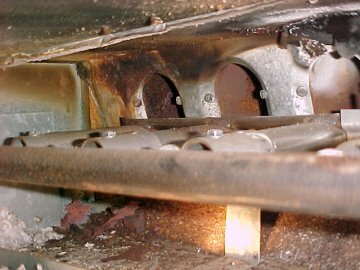 No, even though the burner itself appears to be in good condition, the rusting flakes in the bottom of the compartment caused us to closely check for combustible gases while running the heat cycle; we found that the unit had indications of a cracked heat-exchange. This is a health risk. The unit was replaced by the seller for our clients. Rusting flakes and deteriorated heat exchange compartment. 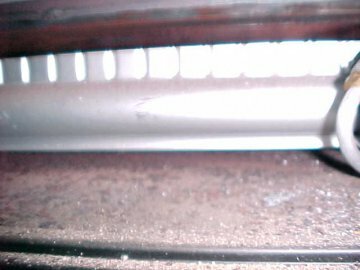 Piled rusting in bottom of burner barrels, we found high CO gases at room vents. 2 of the elements have been burnt open and not providing any heating. We were able to predict this by taking temperature readings and running the system for 20 mins. Heating systems are a big concern, and should be examined closely by one of our professional inspectors. We are not just looking to see if the heating system is heating the structure as many other real estate inspection companies do. We tested and inspected this furnace for our client and found it to show all indications that the heat exchange was cracked. Our client called us back and told us we were right and that we saved them over $2000.00 in repairs that they had the seller pay for before they closed on the property. Our history of professionalism and leadership in the inspection field stands alone from other inspection companies nationwide. Founded on integrity and the highest standards in the industry, you can always count on the best services. We have an impeccable record of excellence with the TREC and all other city, state and federal agencies. We are certified by the city and county of Dallas in their HQS, UPCAP and UCAP programs. We are licensed by the SPCB -TDA as certified applicators in the termite field, the highest level of expertise. We have an experienced certified mold assessor on staff. We are certified site assessment consultants. . We are former licensed lead and mold inspectors We provide commercial and residential inspections and consulting. We provide expert consulting nationwide on any construction related situation. Heating system operation and how it works. Free gas valve check with with 50 PPM electronic gas detector with every inspection, we don't use soapy bottle of water to detect gas leaks..
Troubleshooting a furnace. Flame sensor.